2020 Entry Update: For 2020 and beyond, you’ll have to sit the UCAT exam instead of the UKCAT. 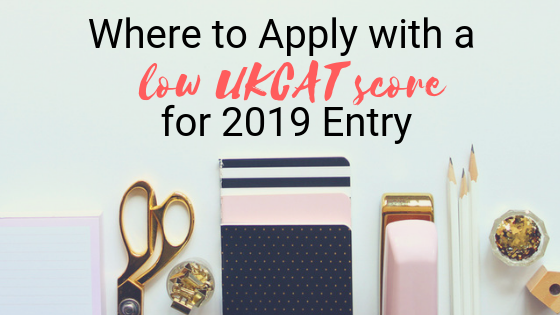 The last year of the UKCAT is 2019 entry. You can read about the changeover here. Please also note that this blog is just a guideline and we recommend conducting your own research and contacting the universities themselves before making any significant application decisions. Scored under 610 in your UKCAT? As a tutor at The Medic Portal, one of the most common questions I get is “where can I apply if I get a low UCAT score?”. Many students believe that a low UKCAT score means the end of the line, but this is by no means true! Although a low UKCAT score may limit your options, there are medical schools where the UKCAT isn’t particularly important. This blog will give you some guidance on applying to medical school with a lower UKCAT score for 2019 entry! We’ve broken down your options depending on your UKCAT score, including the other elements you need to consider at the same time. Cardiff generally does not look at your UKCAT score. When selecting students for interview, Cardiff ranks based on GCSEs and/or A-Level grades (predictions are not used). If an applicant has not completed their A-Levels, Cardiff will rank based off the top nine GCSEs, with 3 points awarded for an A*, 2 for an A and 1 for a B. The top nine GCSEs must include English Language, Maths and the Sciences. Those ranked highest are then assessed on their personal statement. Over the last 5 years, the cut off for GCSEs has ranged between 24 and 26 points. It now ranges between 22 and 26, but this is because they are now including those with contextual flags. Cardiff only uses the UKCAT in what we call a ‘borderline case’. What this means is: if they have two candidates who achieve the same ranking, and they can only invite one to interview or make one an offer, then they may look at the UKCAT as a final tool in making their selection. This all means if you’ve got good academics and a strong personal statement, Cardiff is a good option! There is a minimum cut-off used at Keele but compared to many universities it is quite low. Any applicants in the bottom two deciles of the UKCAT, or scoring Band 4 in the SJT, will not be considered. This cut-off was 582.5 for 2016 entry, 577 for 2017 entry, and 585 for 2018 entry. Be warned it does vary slightly year on year. In addition to the UKCAT and SJT threshold, you will be required to complete a ‘Roles and Responsibilities’ form. This is like a personal statement, but more focused on volunteering and work. This will be assessed to determine who is invited to interview. UKCAT can be used again in a borderline case. If you are applying as international, keep in mind Keele requires the BMAT for students outside the EU, and will instead use this to shortlist applicants instead of their Roles and Responsibilities form. Selection for interview is based on academics and overall UKCAT score, with applicants being awarded points for each. The best nine GCSEs are awarded points, with four points for an A* (8/9) and three for an A (7) grade etc. The maximum academic score is therefore 36. With the six points available from the UKCAT, that makes a total of 42. This means UKCAT plays a relatively small part in the process. Applicants are ranked on their combined GCSE and UKCAT scores with those ranked highest invited to interview. The threshold score varies year on year. It was 30 for 2018 entry, 34 points for 2017 entry and 37 points for 2016 entry. This means if your GCSEs are strong, then you could secure an interview with a UKCAT under 600! Once invited to interview, it is purely the interview score that will determine who are given offers. The SJT is not normally used, ‘except, if necessary, to inform decisions on borderline applicants who have achieved a similar score at interview’. Personal statements are not scored but will be screened as part of the process. You can find out more on QUB’s selection guide. In previous years Plymouth has first screened candidates academically and then ranked them based on their UKCAT score. This means Plymouth uses a UKCAT cut-off – this was 2600 for 2018 entry, and 623 for 2017 entry, relatively low. However, the cut-off in earlier years has been higher. For 2016 entry this was 652.5, and 650 for 2015 entry. In previous years, Plymouth also used a cut-off for each section of the UKCAT as well. However, it appears Plymouth have stopped applying a cut-off for the different sections of the UKCAT. This means only your overall UKCAT score will be assessed. The SJT is not used. At the interview stage, students are scored and ranked on solely the interview score to determine who will be made an offer. For international status students the UKCAT is not required. Stand out with TMP's Medical School Interview Course, created by doctors. We are officially partnered with the Royal Society of Medicine. Our course equips you with top techniques to help you tackle traditional, MMI and Oxbridge interviews. Plus you get a full length mock and comprehensive 20,000-word workbook.